Born into a patrician Boston family in 1852, Robert Grant graduated from Harvard in 1873, later becoming Harvard's first Ph. D. in English. By 1893 he had become a judge, although one of his most famous legal decisions was upholding the decision to execute Sacco and Vanzetti while on Governor Fuller's Advisory Board. He also advocated more lenient divorce laws. Grant was a Fellow of the American Academy of Arts and Sciences, and a good friend of Edith Wharton. 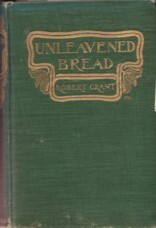 Note: Abebooks.com, amazon.com and other bookselling sites list e-book or ASCII text versions of Robert Grant's books for sale, but these are freely available public domain texts and the same books (perhaps even the same versions) are available free from Project Gutenberg. You may want to check Project Gutenberg before paying for an e-text version of a public domain text.